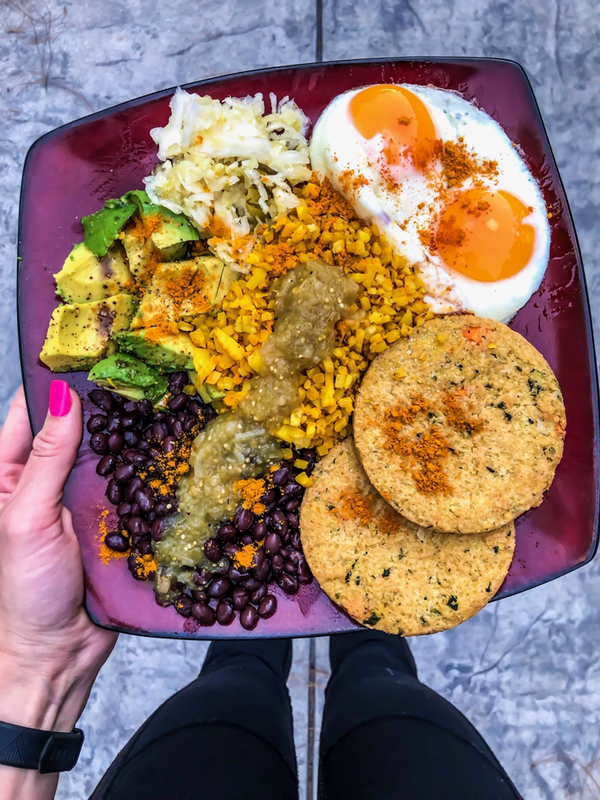 A food post for you today! I hope you enjoy! I love to talk about food, look at food and eat food. But truth be told, I don’t like to prepare food all that much. That’s why I don’t post a ton of recipes, because my meals are mostly “assembled” rather than cooked, if you know what I mean. 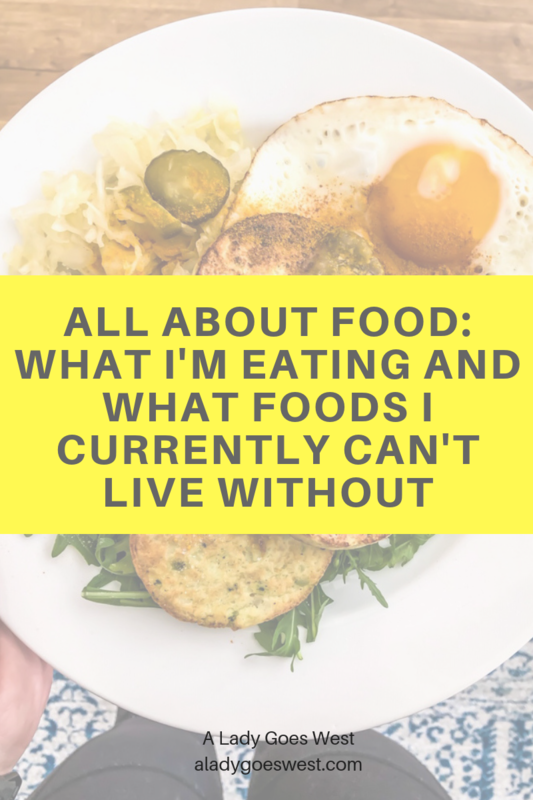 But food is important, especially when you want to feel your best, and I get a lot of questions from you lovelies about what I’m eating, so today, we’re going to dig in. Now, I know you love to see “What I Ate Wednesday” posts, but this is better, because it’s got a lot more information. And remember, you should eat what you like and eat what makes you feel good and what gives you energy. That’s how I do it. I don’t subscribe to any particular diet, nor eating windows, and I definitely don’t count macronutrients. I know that counting macros would probably help me change my body composition, but it’s not something that I want to focus on, obsess on or spend my time doing right now, so I don’t. But it does work well for some people, so I’m in support of it, if it works for you. Just because I eat something doesn’t mean you need to eat it. We’re all different. This is nothing but a current snapshot of my favorite foods, and it will likely change as the months go on. I often get on “kicks” that last for a few months. As you can see, I go for convenience, and often buy pre-chopped organic veggies rather than chopping my own. That’s a product of being a busy mom with a toddler. But even if I wasn’t busy, I’d still go for convenience. I’m not a registered dietitian, so you’ll want to speak to one of those if you have any dietary questions or issues. My weekday meals are rather repetitive, but never identical and almost always prepared at home. And when it comes to weekends, there’s more variety and more meals out. Food should be enjoyed! It should make you feel good and you should like the taste of it. If it doesn’t do either of those things … don’t eat it. It may not be cool to eat breakfast any longer due to the whole intermittent fasting thing, but I’m an active woman of child-bearing age who cares about hormonal balance, and I’m NOT into skipping meals, so breakfast is life. Banana — I literally have a banana every single day of my life, usually even when traveling. I just love bananas. Dave has one most mornings too, so sometimes it’s a fight over who gets the most “ready” banana. And it’s usually me — just a few brown spots is perfect. 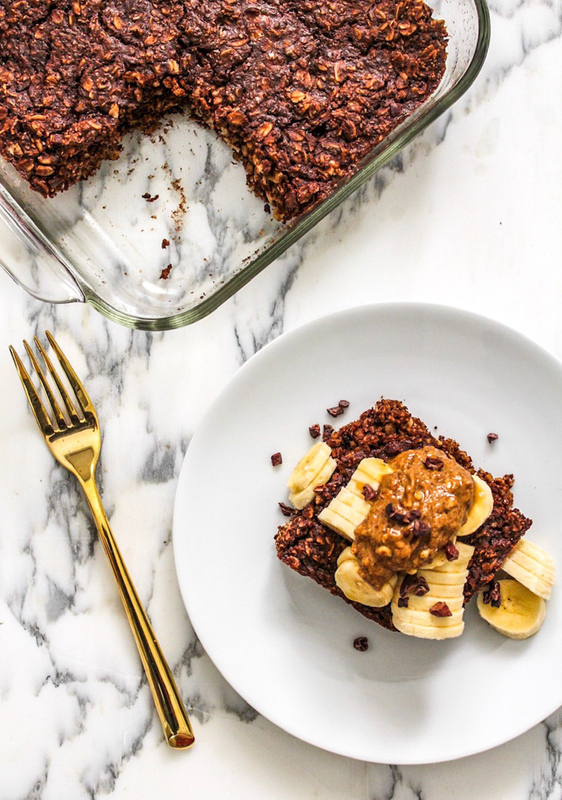 Almond butter — To throw on top of my banana or oats or toast or anything. I like crunchy, salted and natural with no additional ingredients. 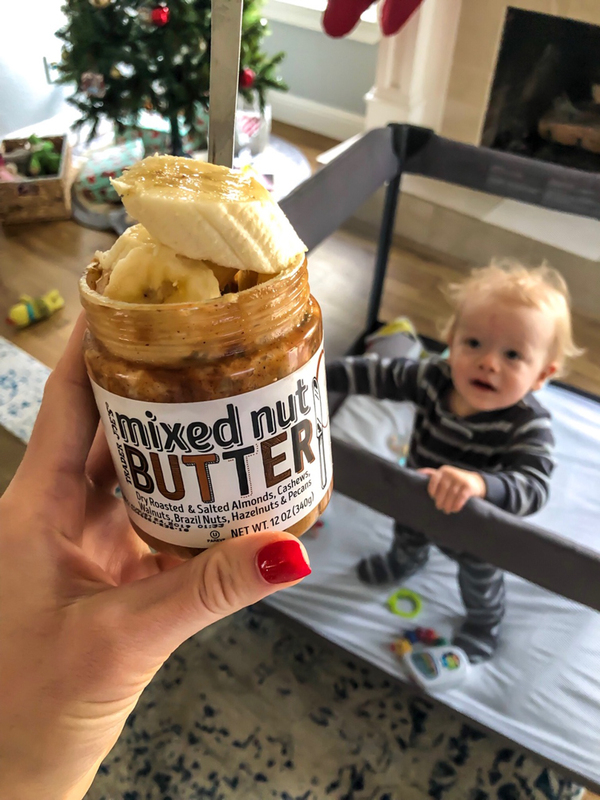 I’m cool with sunflower and peanut butter too, but raw almond is my favorite of the nut butters. Green tea/stevia/cinnamon/honey/collagen/coconut milk — My morning tea is my favorite. I have it every single day without fail and often travel with stevia and collagen just to make sure I can add those things to my tea if I have to get it out. And now that I have my frother — life is good. This is the Vital Proteins kind of collagen I use daily in my tea. Almost every day of the week, I have some version of oats, topped with a banana and sprinkled with chia seeds and pumpkin seeds, always with that big mug of tea. 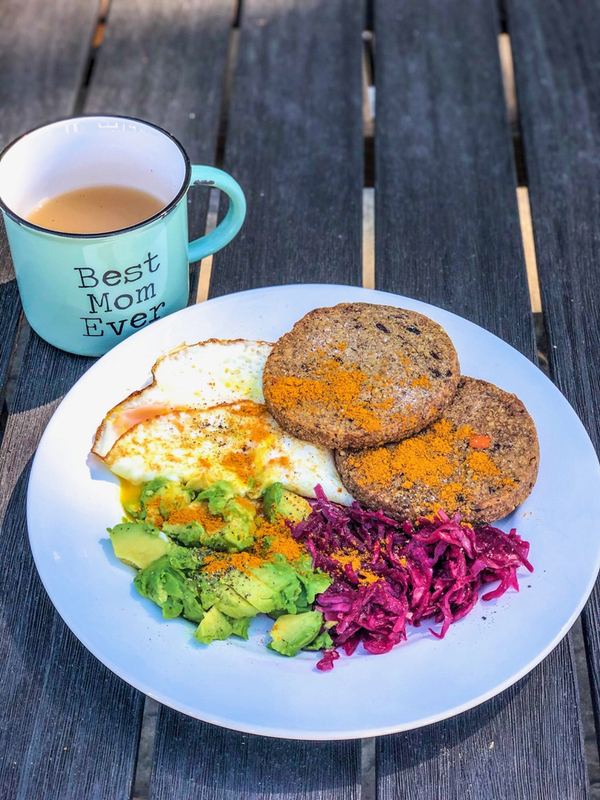 I eat breakfast around 8 a.m. while Brady is playing in his pack-n-play, and I typically check my emails and answer a few things while eating. That middle of the day meal is usually a hot one for me, and it’s always colorful too. Eggs — Eggs for lunch! Yes! Even when I was working in an office daily, I would have eggs for lunch, because I’d bring hard-boiled eggs. Eggs are just so versatile and tasty and full of protein and nutrients. I eat two eggs at a time, usually over medium with a runny center for dipping. And I only buy one brand of eggs, it’s the Vital Farms pasture-raised, and they have the most wonderful orange yolk. Sauerkraut — I eat sauerkraut because I like the tart taste, but I also like that sauerkraut is a fermented food and has good bacteria for the gut. It’s helpful to eat fermented foods, to help your digestion and stomach operate smoothly. I buy my sauerkraut at Trader Joe’s or Whole Foods. It’s cold and stays in the fridge for a long time. Avocado — Because I love them. I eat a whole one at a time and sprinkle with sea salt and black pepper. Leftover veggies — My lunch usually includes some leftover veggies from dinner from the night before, which I heat up in the microwave and pair with my eggs, sauerkraut and avocado. See below for more details on the veggies. Bone broth — Especially during the colder months, I love to have a mug of bone broth as a side to my lunch. I add sea salt, black pepper and turmeric to flavor it. I usually eat my lunch around 2 p.m. while Brady is napping, and unfortunately, it’s consumed while working on the computer. If I had endless time, I’d sit in silence and stare out the window while eating and chewing longingly like you’re supposed to — but that’s not realistic for me right now. 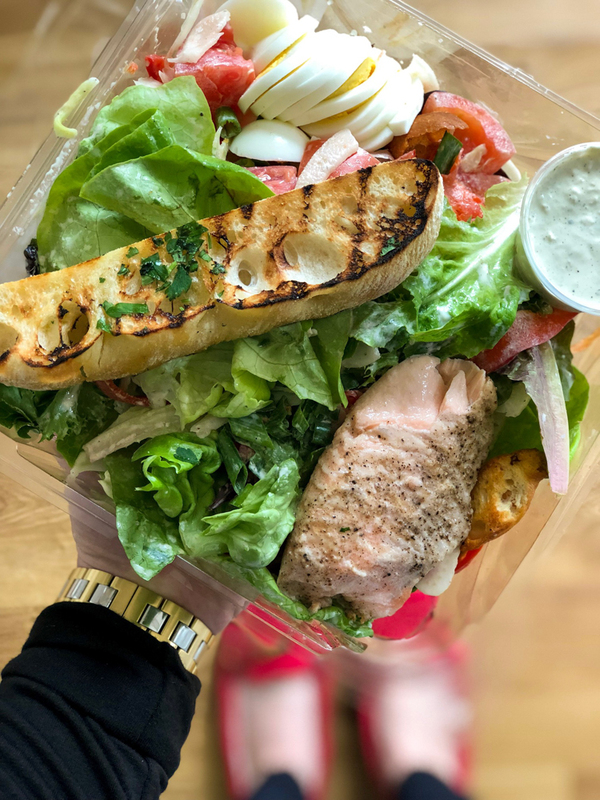 On the weekends, Dave and I typically get take-out salads with garlic bread from a rotation of a few local spots, and I look forward to those meals with no prep and no clean-up. When it comes time for dinner, I’ve already fed Brady and cleaned up the kitchen multiple times during the day, so we like to keep it very simple. Assembled plates and mixture bowls it is. 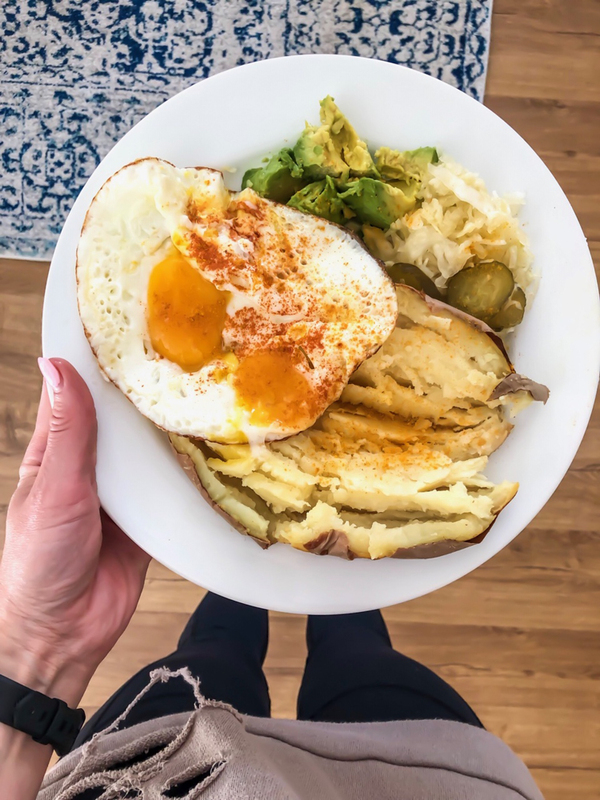 Eggs again — The perfect protein, and yes, a lot of times, I eat eggs twice a day — only during the week though — because I usually skip eggs on the weekends and get lunch out and have something different for dinner. Lentil pasta — I don’t know when I started eating lentil pasta, but when I was pregnant, I ate it like five nights a week for dinner and mixed so many things in with it that Dave started calling it my “goulash.” Dave does not eat lentil pasta with me. Anywho, I like the Trader Joe’s red lentil pasta or Eat Banza chickpea pasta. I treat it like regular pasta, boil it in salted water, add organic marinara sauce, some sautéed cauliflower rice and even bone broth and a scrambled egg for more protein. Cauliflower rice — We keep Trader Joe’s in business with the amount of organic frozen cauliflower rice we buy. It’s a real staple. I sauté it in a pan with olive oil and sea salt and black pepper until it gets a little char, then use it as a side dish topped with salsa or add it to lentil pasta. Organic black beans — I buy canned organic black beans and use them as a side dish to our veggie burgers maybe once a week. We split the can, and no, I don’t wash them. Maybe I should, but I don’t take that extra step. I like beans — great protein and fiber. Avocado — An avocado a day keeps the doctor away. I sometimes have an avocado with lunch, but always with dinner, sliced up and covered in sea salt and black pepper. Organic sweet potatoes — This is another one that I will either have with lunch or dinner. I like the purple and the white organic sweet potatoes the best, and usually Dave and I will split a big one, or I’ll save half for my lunch the next day. Butternut squash — I love to buy the pre-cut cubed butternut squash at Whole Foods or Trader Joe’s and roast it with coconut oil, sea salt and black pepper. 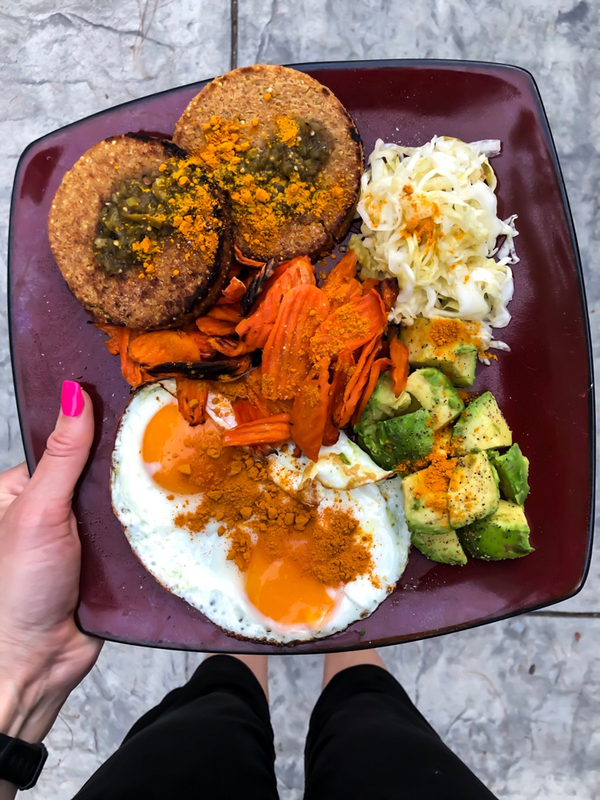 It goes perfectly with veggie burgers, eggs and avocado — and if we have sweet potato as a side, then we usually don’t do butternut squash too, since they are a little similar. Brussels sprouts — I took a few months off Brussels sprouts because I was so averse to them during pregnancy, I never wanted to go back. Well, I went back, and dang, they are good. 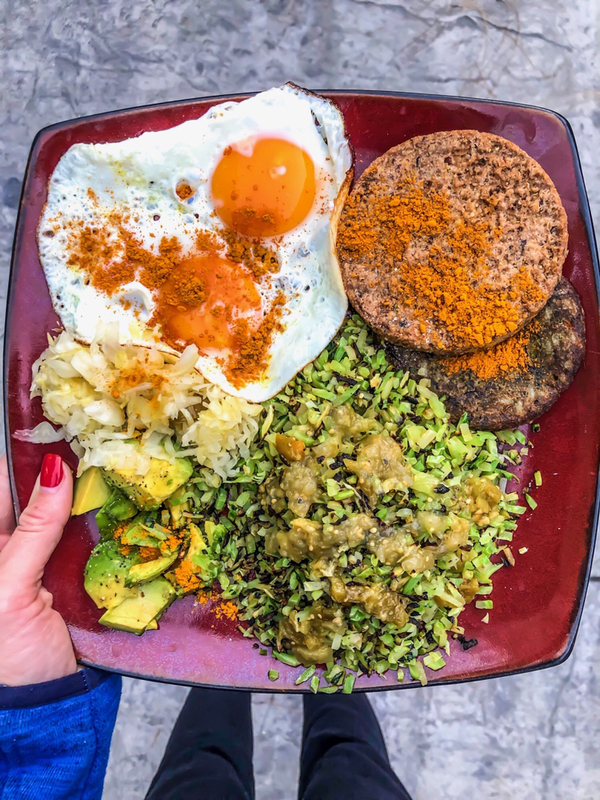 I like to roast my Brussels covered in coconut oil, sea salt, black peppers and turmeric, and they are a great side to veggie burgers and eggs and avocado. So dinner on the weeknight is either a veggie burger, egg, veggie combo platter using some line-up of the above listed foods or a lentil pasta bowl of goodness. When it comes to the weekends, we have grocery store sushi and miso soup on Fridays, random tasty stuff on Saturdays (out to dinner or maybe grass-fed burgers and sweet potato fries at home, or grass-fed steak and roasted potatoes), then Sundays we always have home-made pizza-oven pizza and salad. And yes, we’re still eating dinner at 8 p.m. or later every night, and yet, I still sleep totally fine and feel great, even though most health experts out there are saying we all need to eat dinner earlier. That just doesn’t work for us right now, so we don’t do it. Always snacking. I typically have a mid-morning snack between breakfast and lunch and an afternoon snack between lunch and dinner. 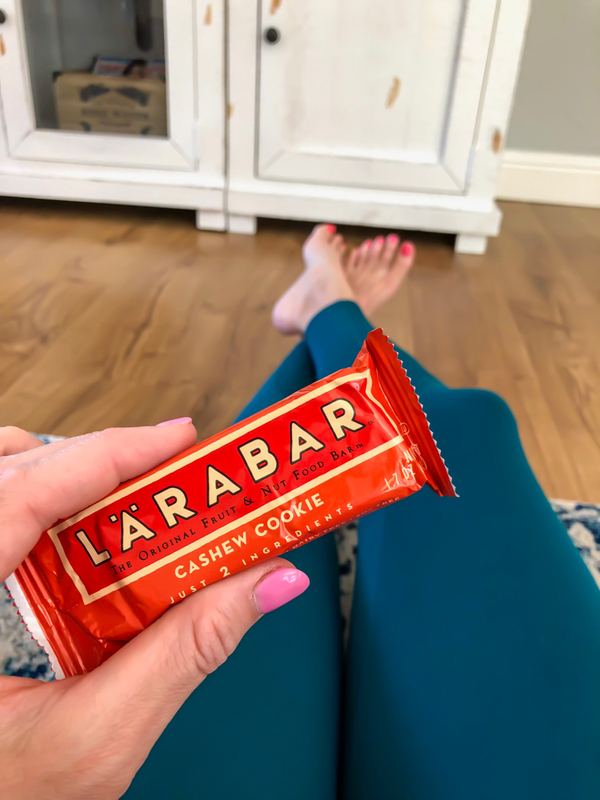 Larabars — I buy them in large quantities at Target, where they are only $1 each if you buy them in big boxes. Can’t get enough, and I usually have one a day, with Dave having one a day most days too. That’s sometimes 14 Larabars a week … and sweet little Brady likes to nibble on them too. Raw almonds — I like to get the single-serve packets from Trader Joe’s, but I also just do the big bag of raw almonds and have a handful here and there as needed. Protein shakes — I drink a protein shake after my workout maybe three times a week (usually after the harder resistance workouts or when I know I won’t be eating any time soon). I’m always trying new protein powder and am currently using the this Sunwarrior chocolate one, and I mix it with water. 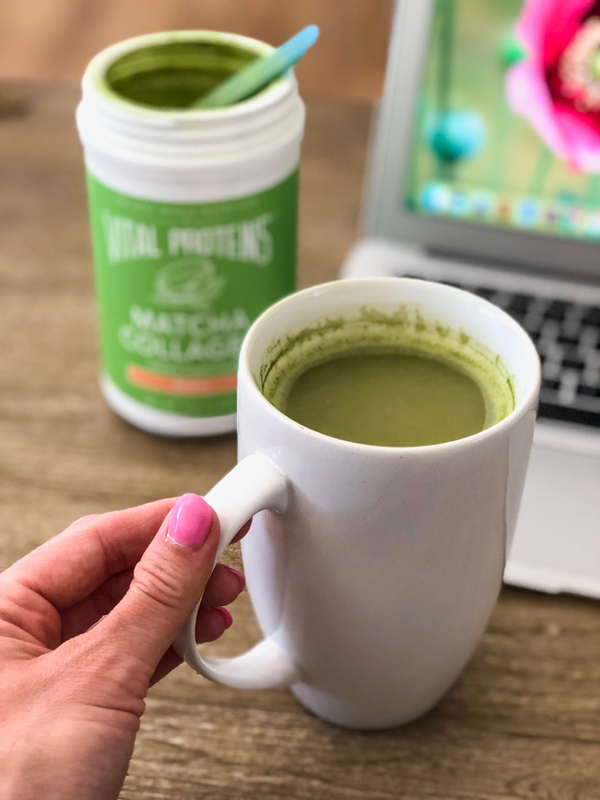 Matcha lattes — We’ll file this one under snacks, but every single afternoon after lunch during the week, I make a matcha latte using this matcha powder, coconut milk, cinnamon, stevia and that trusty milk frother. Coconut- or almond-covered dates — This is actually a “dessert,” but I’m putting it in the snack section. I literally cannot finish a lunch or dinner meal without a date as my dessert. I buy multiple boxes of almond-covered and coconut-covered dates at a time, because Dave likes them too and we go through them quickly. 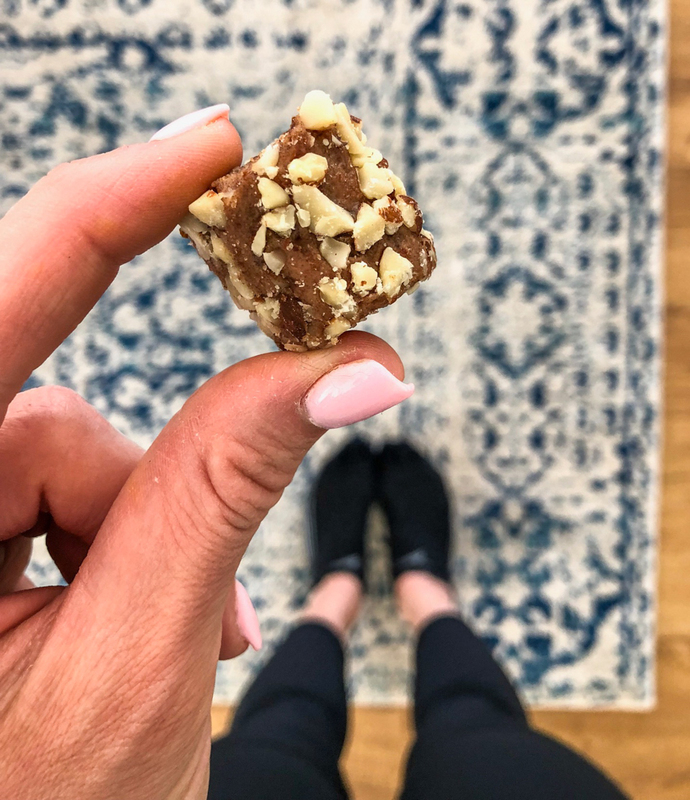 It’s the perfect healthy sweet bite to make you feel satisfied. Love them — and I’m even known to bring a few with us when we are eating out, so we always have a sweet on hand if the dessert isn’t happening. I don’t eat the exact same thing every single day at all, but as a creature of habit, I rotate through the selection above in different combos, and it keeps me full and happy. Depending on the size of my meals and timing, some days have more snacks than others. It really just depends. Oh, and if it’s the weekend, you can bet instead of the matcha latte made at home, I’ve hit up Starbucks for a big sugary beverage. And no, those don’t necessarily make me feel wonderful, but I like them anyway. And that’s about it — most of the foods that I eat on a regular basis and can’t live without right now. As you can see, it’s mostly veggies, fruit and … eggs. I’m not opposed to high-quality meat or dairy at all, and I always have both on the weekends, but we just like to keep our prep simple during the week, so it is what it is. Thanks for reading all about food, my friends! And have a GREAT start to your week. 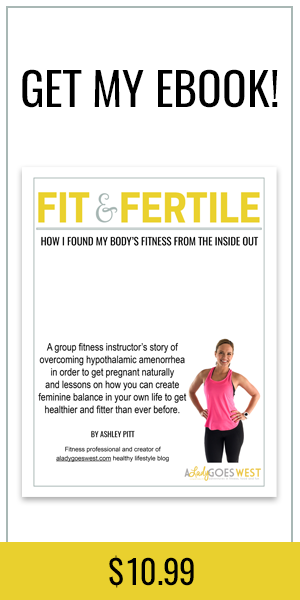 Also, make sure you enter this fitness giveaway, in case you missed it. Happy eating! P.S. 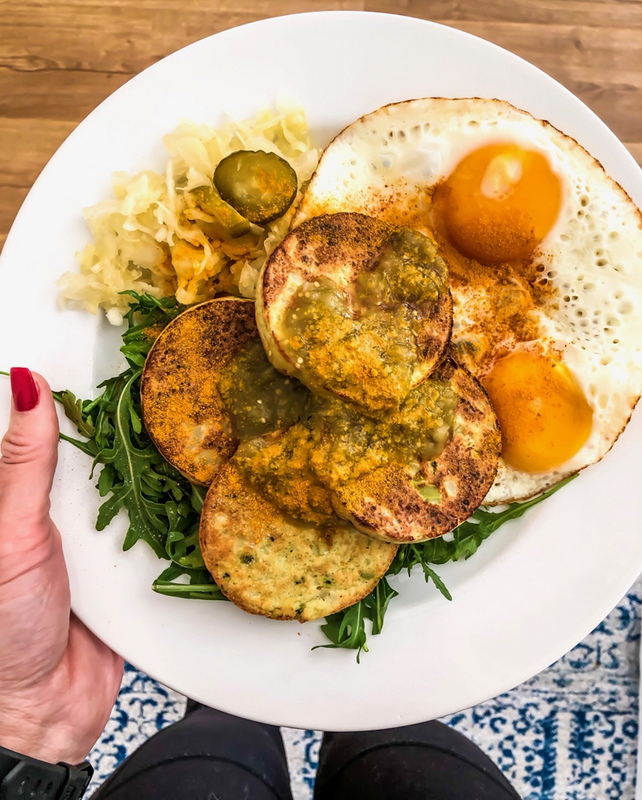 This food post is essentially a reader request, because I got so many requests for “What I Ate Wednesdays,” so if you have a post request, please let me know in the comments or shoot me an email. See ya soon! Are you a meal cooker or assembler? I’m a food repeater too. If it ain’t broke…. For me, I’m personally struggling a LOT with health and feeling good, so I have to keep things pretty consistent. I do not follow any specific diet like IF or keto, but I do eat entirely gluten free because of my issues. I have never counted my macros, but I am about to sign up with someone to help me with a plan for that because she also has some background in some of the things I’m struggling with. So I’m hoping it might help me FEEL better (emphasis on feel because as MUCH as I would love to ditch the cellulite and lean out more, my focus right now is feeling good). Anyway, quick question and I know you aren’t a nutritionist or dietitian but we are friends so no need to include the disclaimer for me hehe but do you have a max # of eggs you will eat in a day? Because sometimes I have 3 hard boiled eggs for breakfast and am tempted to put one on my lunch salad but am concerned that 4 would be overkill. Thoughts on that? Hi Court! So I’m not worried about any of the ingredients in eggs — I like the fat, and I know I have really good cholesterol, so that doesn’t bother me — so maybe 3 days a week, I eat 4 FULL eggs in a day — not a problem for me at all. Especially because I buy the good kind too. And I do have a few days a week where I don’t have any eggs, so I figure it all equals out hehehe. And that’s nice you are going to work with someone on your diet to see if it helps — wishing you LOTS of healing luck, my friend! Loved this post, Ashley! It’s a great reminder that eating healthy can be easy, delicious, and on your own terms to fit your lifestyle. 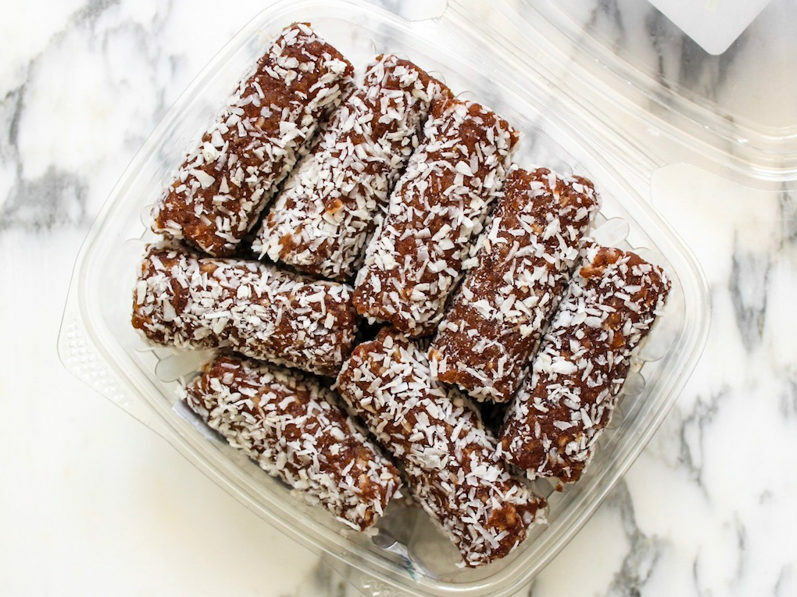 Fun fact – because of you and your blog, I’ve been buying and enjoying coconut and almond date bites for several years now, too! Delish! The dates aren’t cheap, so sorry I got you hooked — but like — why are the best thing ever? hahha Thanks for reading, Lindsay. Hope your weekend was great! Awesome price!!! 🙂 heheh! Yay! Publix! My grocery store just has larabars and rxbars on sale for 77 cents… I bought 40 of them! Hahaha. It felt a little excessive, but totally necessary. Okay, so jealous! I would buy 40 or more for that price too ahhahah I mean, they are so tasty and come in handy. Such a good snack! Hope you had a great weekend, Julie! Larabar are a family staple here. I even got my friends to buy them this weekend at Target. Peer pressure on good clean bars, I’m down with that! And yeah for breakfast. I was feeling guilty lately for it being my favorite meal and so many people hating on it. I appreciate you saying you love it too! Ohhh thanks, Shelby! Glad you enjoyed! And no — eating healthy is actually pretty simple — and a lot of healthy food is quite tasty, so it’s a good thing. How come you don’t include cheese on a more regular basis? That is one thing I can’t live without. Cottage cheese as a snack daily and goat cheese or blue cheese on salads and roasted veggies. I love breakfast and eat a snack before bed, so I am also not a fan of IF, or any food rules for that matter. Hi Mo! This is just a current snapshot, and I used to eat a lot of cottage cheese and sometimes still buy it, but I’m never in the mood for a cold snack so haven’t been buying it lately. I eat a lot of cheese on weekends on salads or pizza or whatever, but it’s not a fridge staple for me currently. I agree that cottage cheese is SOO versatile though and I may be due to pick some up. I love this post. I like how you said you assemble meals rather than cook them because that is SO me. I assemble meals and my husband wants cooked meals. I’ll whip up something quick (just had a black bean and cheese quesadilla and a raw brussels, avocado, and blueberry salad for lunch) and be totally happy. I’m also an egg lover. I eat 2-3 every day and hate when people want to cut out the yolks. The yolks are so good! I eat a lot of the same foods on rotation too. I’ll go through salad kicks or quesadilla or chili kicks, but then won’t eat those foods for awhile. Now that I have a toddler, I feel the need to try and make different things because he needs to like more than just the 10 foods I eat on a regular basis, haha. But it’s just so easy to eat like this. Hi Liz! Totally agree with all of this — Brady is currently eating mostly what I’m eating, so I know I should branch out for him, but I’m just so happy he finally eats heheh! Three cheers for the assembled meal! Hi! Yes I can do that soon — he’s eating a lot better and more and most of his food is similar to mine! I love this post! So I do a lot of both cooking and assembling I am a mostly (I work a few hours a week part time) SAHM with a full time working husband who loves cooked dinners, and a daughter I “assemble” food for all day hehe. I still struggle to find a groove with lunch to be honest. 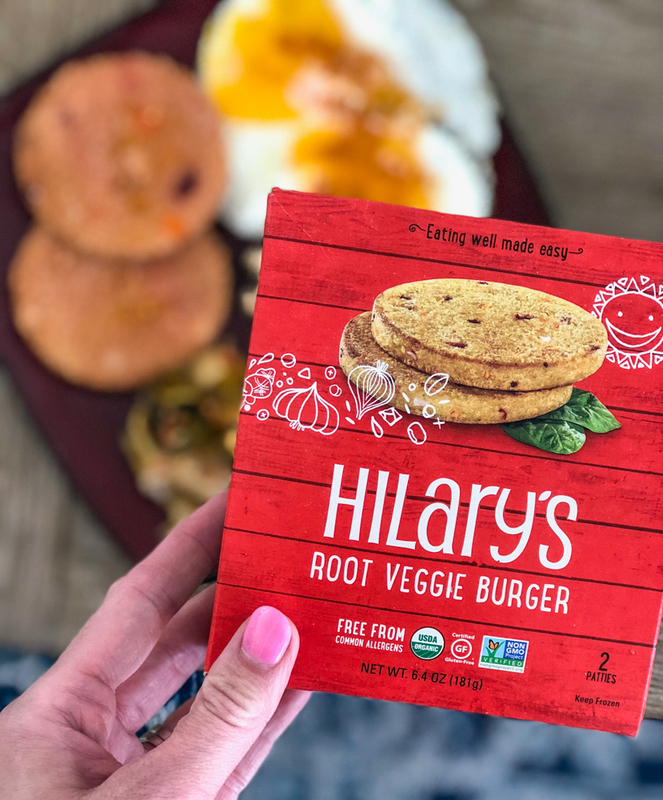 I also enjoy veggie burgers, I give one to my daughter often and so I might make myself one. I’ll put it on some salad greens and add either hummus or an egg. If I have some quinoa salad I like to grab from the deli, I’ll put that on some greens as well. Sometimes I just snack which I am sure isn’t ideal! Haha. Foods I couldn’t live without right now are things like Lara bars (brownie is my fav), coconut yogurt (silk brand), raw almonds, popcorn, green grape, sparkling water, and ice cream ☺️ Hoping to get into a lunch and breakfast routine that keeps me feeling my best soon! Question if you care to answer- any reason you avoid meat most of the week? Thank you for this post! It is always fun to get new ideas from others- especially for lunch and breakfast, as I too eat the same things on repeat. Then I burn out and want to try something new! 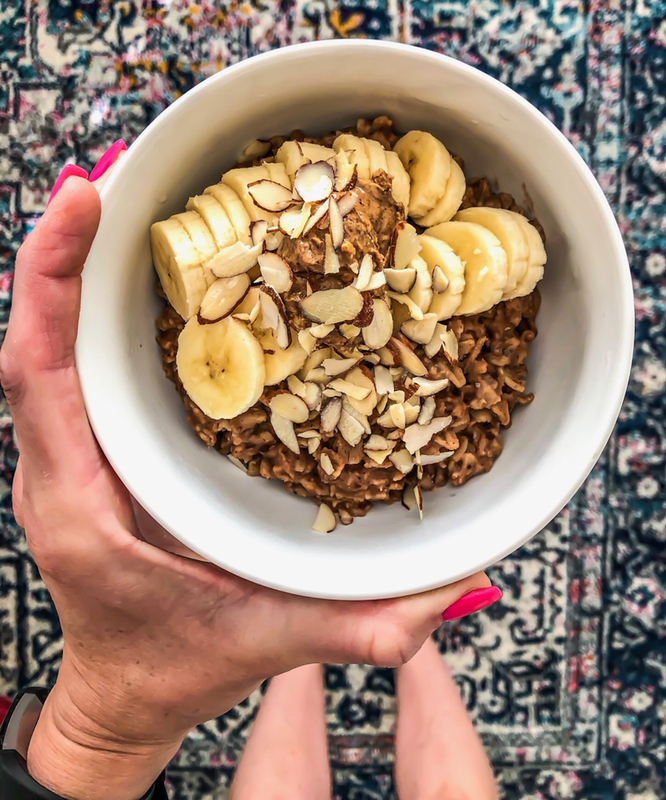 It’s good to try new things in your meal rotations for sure, Laura! 🙂 Thank YOU for reading! Glad you enjoyed! I like my bananas cold and as unripe as possible, sometimes I eat more than one a day! I LOVE them! Love this post gave me lots of great ideas! And FWIW I tell my clients to eat when hungry not cut off by some arbritrary time. I ate dinner at 83p two nights ago and 5 tonight. Eat when hungry and life allows! Great post Ashley! 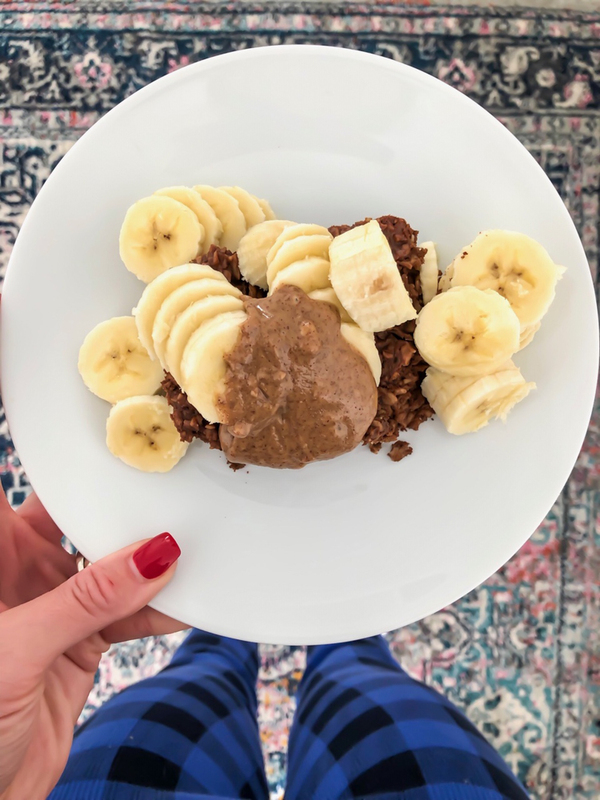 Nice to see someone in the fitness industry that eats hearty and healthy meals without obsessively tracking calories, macros, points or whatever is in at the moment. If I had to only have one food it would probably be really ripe bananas. I LOVE them and have a few a day. Other staples include organic lactose free whole milk with coffee, our chicken’s eggs, homemade yogurt, raw or roasted almonds, walnuts, large salads with loads of herbs, vegetables, some protein (chicken breast usually) and carbohydrate (Jasmine rice or sweet potato/regular potatoes). 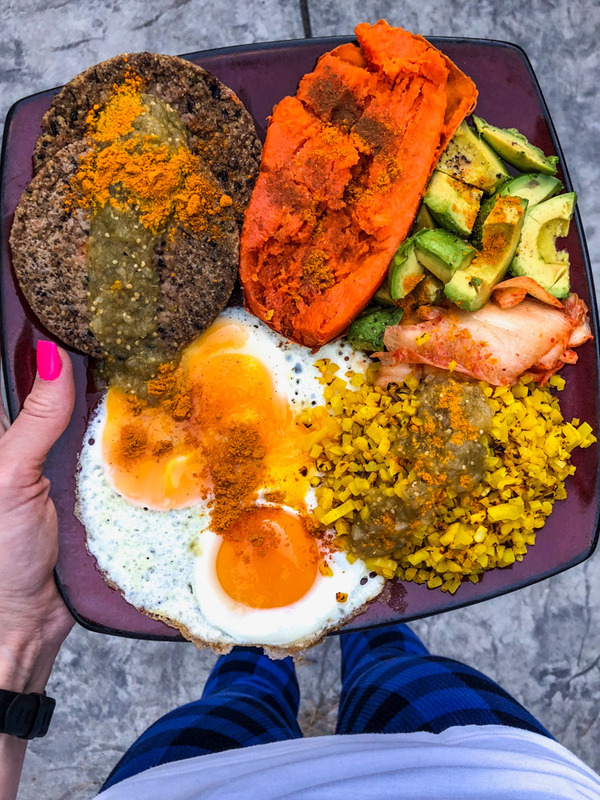 I use lots of herbs and spices (turmeric, ginger, paprika, etc) and make my own dressing with honey, mustard, avocado mayo and vinegar. I slog through the washing, chopping and other prep rather than buy the assembled kits, haha. I also make homemade vanilla ice cream with cream and whole milk. I stir in cinnamon and cocoa powder. It’s amazing. Okay Eugenia! You sound like a PRO in the kitchen, with all of the stuff that you make. And you have a chicken who lays eggs? Amazingness! I love to hear about your diet and your love for healthy food too! Thank YOU for sharing all of this! wow oh wow this allll looks so good! 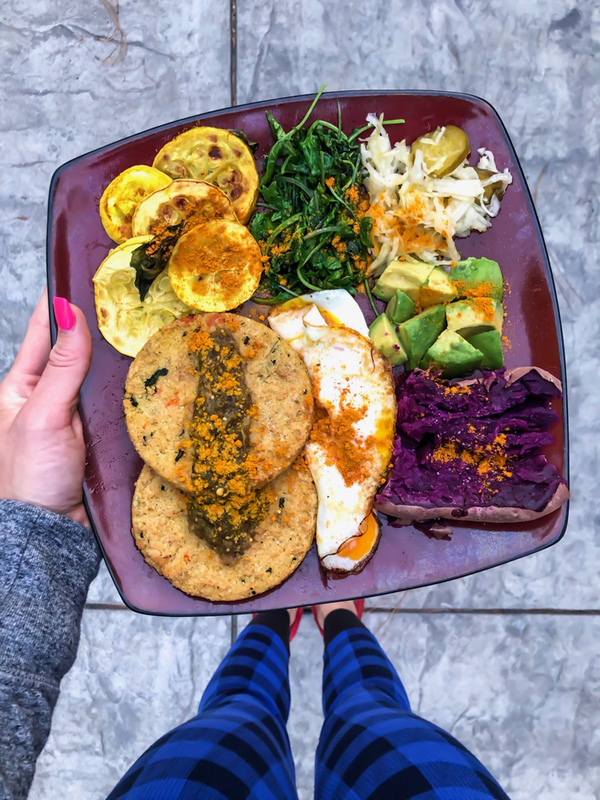 Thanks for sharing such yummy food inspo, Ashley!